Don’t let the Super Bowl derail your plans to eat healthier. There are options that are healthy, tasty and sure to please your favorite football fans. Try these healthy Super Bowl snacks! Preheat oven to 425°. Cut zucchini into 3-inch “fries”. Whisk the egg white in a small bowl, then add your milk. Mix the Parmesan and seasoned breadcrumbs in a separate bowl. 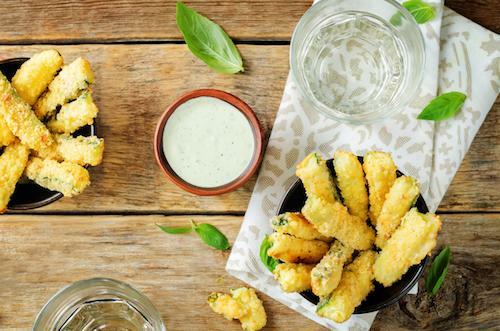 Dip zucchini fries into the egg mixture, and then roll in breadcrumbs and cheese. Place the fries on a coated baking sheet and then bake for 25–30 minutes or until golden brown. Use your favorite dipping sauce as well. Pair these with some spicy Chicken Wings with Ginger Sriracha Sauce or the Creamy Spinach dip I posted a couple of weeks ago and have yourself a Super Bowl feast that will keep you on track!